Welcome to my blog! I see on your website that you are a native of Washington, DC and that you grew up in Northern VA. I lived in the NoVA area from 1978 through 2002. I wonder if our paths ever crossed! Cathy: Maybe we did! I grew up in Arlington and Fairfax, and lived in Loudoun County in 1994. By then I'd learned there are places in the world where people don't sit in traffic for hours and don't organize their lives around rush hour. As beautiful as Virginia is, I was glad to escape! Linda: Hmm. I was in Loudoun in ’94. We left that area for many of the same reasons. Your bio indicates that you were not looking to be a writer until a song planted a story idea in your head. Can you tell us about that? Cathy: Harry Chapin's "Mail Order Annie" transported me to 1873 Dakota Territory. A red-tailed hawk spiraled over the empty prairie. Creosote from new railroad ties tainted the wind. A lonely farmer met his timid bride, neither prepared for the surprises marriage would bring... which you can read all about in Spring for Susannah! LM: You’ve released two more books. Did the ideas for them come from songs also? If not, how did you come up with their plots? Cathy: History provided the inspiration for the next two. In 1879, right here in Omaha, the trial of Standing Bear gave legal status to Native Americans. As I dove into the events leading to this landmark court case, I found a Russian woman teaching on the Ponca reservation. A woman with the same name taught French at Vassar near that time. Russian royalty spoke French. What if a teacher from this prestigious women's college ended up at one of the most impoverished schools in the country? Sophia's story became Through Rushing Water. I wanted to do a story set in Virginia, since my mom is a Virginia history librarian. The Blue Ridge Mountains are blessed with abundant mineral springs. Resorts built around springs became social centers for wealthy Southerners to take the waters and flirt. Mom and I wandered the back roads, looking for remnants of these old hotels, staying at those still open. So many story possibilities! 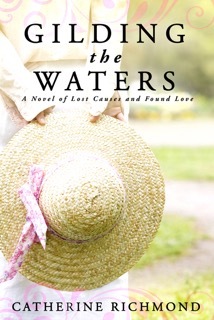 Gilding the Waters takes place when the resorts were on the decline, and asks what happens when your way of entire life changes? LM: You write historical fiction. Do you have an unusual research story to share? 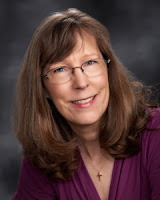 Cathy: While researching Through Rushing Water, I kept stumbling across connections between Standing Bear's trial and one little church. When I found the last connection, I wanted to stand up and cheer - but I was in the state historical library where cheering is allowed only during football season. What a thrill to find a small group of God's people seeking justice and defending the oppressed - and changing history! LM: The age old question for writers-are you a “pantster” or a plotter? Cathy: "Pantster" distracted by research. I know the threads of a story; history weaves it into a fascinating tapestry. LM: Are any of your characters based on real people? Cathy: Several! Teddy Roosevelt tried to take over Gilding the Waters, but no worries - I kept him in line. LM: LOL! What is your next project? Cathy: Third Strand of the Cord is a contemporary romance about a single mom who has a child with Down syndrome. In my work as an occupational therapist, I've met so many amazing parents. Third Strand of the Cord is the happy ending I wish for all of them. LM: What are your passions outside of writing? Cathy: Hiking with my dog, eating chocolate, and travel. I'd like to combine the last two in a round-the-world chocolate sampling tour - who's with me? LM: I’m in! What else do you want folks to know about you? Cathy: I love to hear from readers! Facebook is the easiest: https://www.facebook.com/catherinerichmondfans/. Or my website http://catherinerichmond.com. Or twitter @WriterCatherine.